When people in Bergen County need heating services, they know GRC Mechanical Services is a name they can trust. We have been providing reliable heating services to people for more than 60 years, and we pride ourselves on expert heating system maintenance, repair and installation. As a Carrier® Factory Authorized Dealer, we uphold rigorous standards when it comes to the heating products and services we offer. Our technicians receive extensive factory training so they’re able to provide you with the comfort solutions you need. We maintain all required licenses and carry the proper insurances. And, we offer quality Carrier products to our customers, in order to help them achieve the best home comfort and efficiency possible. GRC Mechanical Services provides maintenance for your Bergen County home’s heating system. Whether you own a gas furnace, or have a boiler installed in your home, we’ll make sure your system is running great. That way, you can count on better efficiency and worry-free heating all winter long. Nobody wants to think about needing heating repair, but if it happens to you, count on GRC to help. We provide furnace and boiler repair in Bergen County. Our team of expert technicians can repair virtually any make or model of heating system. 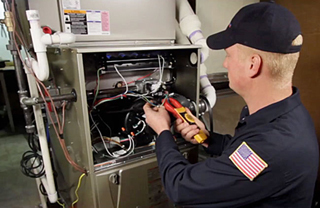 As a result, you can trust us to help get your furnace or boiler up and running again quickly. Get the service you need for your boiler or furnace with a Breathe Easy Maintenance plan for your Bergen County home. This plan provides a comprehensive list of benefits for your boiler or furnace, from one of the best residential plans available. As our home comfort systems age, they naturally become less efficient. Couple that with the fact that every year, manufacturers are developing technologies that make furnaces and air conditioners operate better. As a result, you can imagine that a 10-year old HVAC system is probably costing you more in energy than need be. But, getting new home comfort equipment is an expensive proposition. Many people don’t really plan for the day that they’ll need a new furnace or air conditioner, and unfortunately many have to replace theirs because of a breakdown. Therefore, it’s important to think of your home’s HVAC system like you would your automobile – get it the maintenance it needs, and plan to replace before it breaks down. The Department of Energy suggests that upgrading to a high efficiency system is an effective way to cut down on home comfort costs. They also explain that many of today’s heating systems offer between 90-98.5 percent energy efficiency – that means that only a very small fraction of heat is lost, and most is used to keep your home cozy and warm. And, that translates to lower utility bills. So, if you have an older system that’s been needing repairs and jacking up your energy use, it probably is time to replace. Right now, you’ll save with Carrier Cool Cash and GRC Mechanical. When summer reaches its peak heat, it’s important to have an air conditioning system that works well. You want your home to stay nice and cool, and your energy usage to be at a minimum. Of course, like any other mechanical equipment, you can expect that your system need some minor fixes on occasion. But, if the AC repairs for your Paramus, NJ home have gotten out of hand, it might be time to think about a new system. An article on the Angie’s List website provides some insights into whether you should repair or replace. The article points out how to know if AC repair is the way to go for your Paramus, NJ home. First and foremost, you should consider the age of your system. If your system is older (more than 10 years old) it could be time. If you have an older system and you’ve noticed a hike in your utility bills, it’s just not working as efficiently as it should. Couple that with expensive air conditioning repair costs, and a new system may actually end up saving you money. Here are a few more things to think about when it comes to AC repair for your Paramus, NJ home. To do this, simply multiply the age of your system times the cost of the repair. For instance, if the repair is $200, and your system is 10 years old, that equals 2000. Since it’s less than 5000, you should go for the AC repair. If, however the repair would cost $650, that would equal 6000 – meaning you should consider installing a new system. Evaluate your system’s energy efficiency. When Mother Nature turns up the heat in the summer, homeowners appreciate air conditioning in their Mahwah, NJ homes. Your air conditioner keeps you comfortable and makes your home a welcome haven. Most people nowadays do have an air conditioning system of some sort in their homes. And, in those households, about 6 percent of their annual energy use goes toward air conditioning. But did you know that improper maintenance can make your energy usage much higher? So, what’s one of the best ways you can make sure your air conditioning system is at peak performance? By making sure the filters are clean. And, if the filter is dirty, changing it is important. A dirty filter places unnecessary wear and tear on your air conditioner because it has to work harder to circulate air. Not sure how or when to change your filter? That’s where GRC Mechanical comes in. GRC Mechanical helps Mahwah, NJ homeowners with all their AC needs. At GRC, we know how important keeping your air conditioning system up to snuff is. As a result, we offer our customers the Breathe Easy maintenance plan. This plan was made to first, find any problems with the air conditioning in your Mahwah, NJ home. What’s more, it provides solutions. With the Breathe Easy plan, you and your family can enjoy healthy, energy-efficient comfort. When the summer heat strikes in Bergen County, NJ, having an air conditioning system in good working order is vital. If your AC system is in frequent need of repairs, keeping your system running is a costly venture. Many times, homeowners aren’t sure if they need to repair or replace. ENERGY STAR offers some guidance on how to know if an air conditioning repair is in order, or if you need to consider a new system. If your air conditioner is more than 10 years old, it might be time for replacement. The older a system gets, the more inefficient it becomes. And that can cost you more in utilities. ENERGY STAR also cites the frequency in which you need air conditioning repair in your Bergen County, NJ home. If you need extensive repairs often, it is probably costing you more in the long run than a replacement may cost. Also, are some of the rooms in your home hot, while others are cold? While this could be a problem with your ductwork, it could also lead back to your AC system. An air conditioner that isn’t operating properly, or is poorly sized, can result in uneven cooling of your home. By nature, an air conditioning system should also help dehumidify your home. If that’s not happening, ENERGY STAR says it could be due to poorly operating equipment. Finally, noisy systems are pretty good indicators that something is up. Sometimes the noise can be remedied by a simple AC repair in your Bergen County, NJ home. But, it can also mean there are problems with your indoor coil – and that can be costly to fix. When summer rolls around, so does your need for air conditioning. Nothing is more refreshing than coming home to a cool house when the outdoor temperatures are soaring. When your home is air conditioned, you feel more comfortable, sleep well and some people even breathe better. So if the AC in your Mahwah, NJ home isn’t working properly, the chances are you and your family are suffering for it. Of course, if your system completely stops working, you’ll know it right away. But, there are other signs that can indicate your system needs repair work soon. They can be much more subtle than a complete breakdown. The Houselogic website shares some signs you should look for if you suspect your AC isn’t working properly. You’ll be surprised to learn many require a simple, low-cost fix to get your system up and running great again. At GRC Mechanical, we can help you get the repairs you need for your AC system. You’re not as cool as you’d like to be. Often, if your AC system seems to be underperforming compared to the year before, it has to do with airflow throughout your system. You’ll be happy to learn that the fix for this issue is relatively easy and inexpensive. Usually, the filter simply needs replacement – something that should be done every 30-60 days during months of operation. You’ll also want to check your cold air returns and registers to make sure there isn’t anything blocking airflow. When you need AC services for your Bergen County home, you need a contractor you can rely on. You need to find a trusted contractor is choosing someone who’s licensed, insured, sells quality products and offers you the services you need. Not only will they help you get your AC professionally installed, but to keep it running, too. When you contact GRC Mechanical, you’ll be pleased to discover that we offer all this and more. At GRC, we take pride in offering top-of-the-line AC products and services to people living in Bergen County. Our technicians are professional and offer factory-trained repair, maintenance and installation on your equipment. What’s more, we offer a complete listing of air conditioning products and services. You can rest assured that we’ll be able to help you, no matter what need you may have. You’ll be impressed with the AC services we can provide for your Bergen County home. Air Conditioning Repair: Maybe the air conditioning system in your Bergen County home isn’t operating properly. Possibly, you’ve noticed that you’re simply not as cool as you’d like to be. If that’s the case, it’s likely you need air conditioning repair. You can rely on the experts at GRC Mechanical to provide the air conditioning repairs you need to ensure your system is running safely, reliably and efficiently. New Air Conditioning Installation: You won’t have to suffer through another long, hot summer when you choose expert air conditioning installation from GRC. Our skilled technicians are top-notch and provide professional installation of quality systems. We are licensed and insured, and are a Carrier® Factory Authorized Dealer. You can rest assured that when you install a new AC system with us, you’re choosing the best. Your furnace is a lot like your automobile – you have to take care of it in order for it to last. Even then, there may be times when it needs a repair… and of course, the day will come that you’ll need to replace it. Chances are, you have a trusted dealership where you take your vehicle for maintenance every year, and for service when it needs a repair. And, when it’s time to trade it in for a newer model, you rely on that same dealership to help you choose a new car that meets all your needs – and your budget. You should expect that same level of service from your HVAC contractor. You should be able to trust that they’ll provide you with the furnace services for your Bergen County home that you need to keep your furnace operating smoothly, for the comfort and safety of you and your family. They should offer you maintenance, so that your furnace will receive the checkup and tune-up it needs to keep you and your family warm all winter long. They should offer you prompt, reliable furnace repair so if you suddenly are facing a furnace breakdown, you won’t have to worry about being cold for long. And, when the time comes, they should offer you an energy efficient furnace option that is the right choice for your home and lifestyle.